The Whirlwind DA-2 drives multiple isolated line feeds from a single input source. 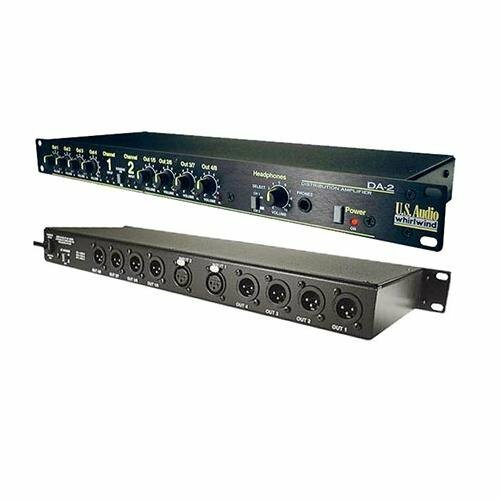 It is ideal for driving lines to multiple amps in live sound applications, distributing audio to multiple tape decks, feeding signals to multiple zoned locations, etc. In normal (stereo) mode, the DA-2 provides four outputs per each of two inputs. A front panel COMBINE switch applies both inputs to all 8 outputs, where the DA-2 becomes a one or two in, eight out DA. Each output is ground lifted and has its own level control and clip indicator light. Input signals are monitored by signal-present LEDs and clip LEDs. The headphone circuit can be switched to monitor either channel. All audio connections are made through actively balanced line level XLR connectors. Where transformer isolation is necessary, the ISO-8 (a 1U 8-channel accessory) is available.